Jane Waterhouse looks serious and races hard. Nevertheless she is very friendly and supportive to other runners. 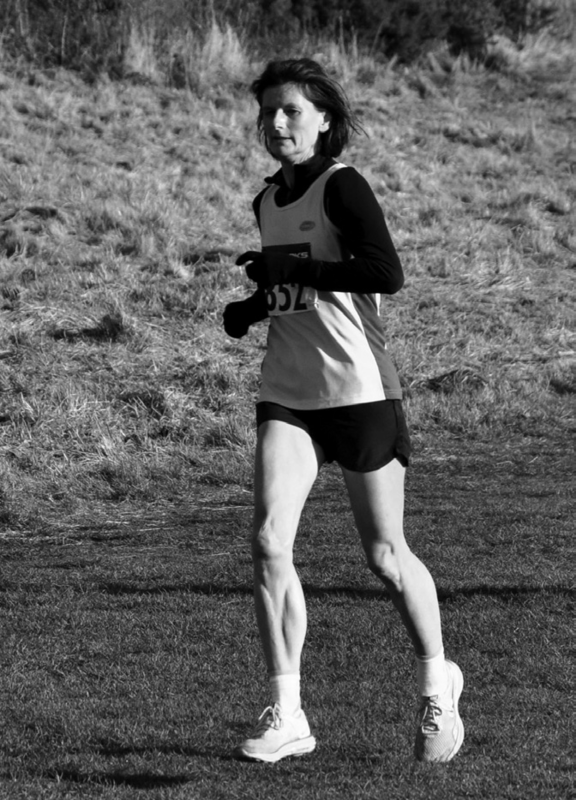 Her modesty hides the fact that she is one of the most successful Scottish Masters cross-country runners, female or male, EVER. I base this assessment on her incredible record in the Scottish Masters CC: Jane has won thirteen individual titles, all by clear margins! She started off in 1997 with the W40 championship; won three W45 gold medals between 1999 and 2001; added three more at W50 (2003-5) plus another in 2007; then secured four W55 titles in 2008 and 2010-12; and started her W60 campaign with gold in 2013. She did not compete in 1998, 2006 and 2009, and suffered her only defeat in fourteen races when she could ‘only’ obtain bronze in 2002! In addition Jane has been a stalwart team leader for Scotland in the annual 5 Nations CC Masters International. I do not have all her results, but note that in 2007 she was 7th W50, but improved to 5th W55 in 2008 (behind the winner, England’s Susan Cooper). As she states below, her finest performance was at Birmingham in 2009, when her strong finish ensured that she overtook the long-time leader, Susan Cooper, and gained revenge by sixteen seconds to win a rare individual gold medal for Scotland in this very prestigious event. Her team won silver medals, only five points behind the Auld Enemy. In 2010 in Dublin, Jane finished fourth (only ten seconds behind third) and led her team to bronze medals. 2011: 5th and another third place for Scotland; 2012 9th and another team bronze. In the recent 2013 International in Cardiff, she came very close to equalling her 2009 achievement, finishing second W60, only nine seconds behind the winner, England’s Janice Needham. Jane trained especially hard for this race and was justifiably pleased with her performance, especially since she led the Scottish W60 team, who packed very well indeed, to silver medals. How did you get involved in the sport? Through my two daughters. I used to sit and watch them train and then someone suggested I join in. I have never looked back! Has any group had an influence? My training group at Central have always been a big part of my life. It is a very mixed group with a huge age span but always encourages us oldies. What exactly do you get out of the sport? Lots of friends, lots of laughs, some stress (I hate racing) and being able to eat lots of cake. Your best-ever performance? Winning my age group at the 5 Nations International Cross-Country at Birmingham in November 2009. It was my finest hour! Your worst? Plodding around in last position in an inter-league cross country down in the South of England – and they were pulling down the course while I was running. What unfulfilled ambitions do you have? I would like to run another marathon alongside my two daughters but am not sure my knees are up for that any more. Other leisure activities? Singing in a choir. (That is my sensible side.) Walking in the mountains. Looking after my wonderful little grandson Fraser. What does running bring you that you would not have wanted to miss? Keeping fit, making lots of friends from all over Scotland and from all walks of life and being part of our running group. Can you give some details of your training? I train with Central AC twice a week. These sessions consist of repetitions of different distances from 400 to 1000 on fields or track in the summer. I run by myself on the weekend, doing a tempo run on Saturday and a longer slower run on Sunday.